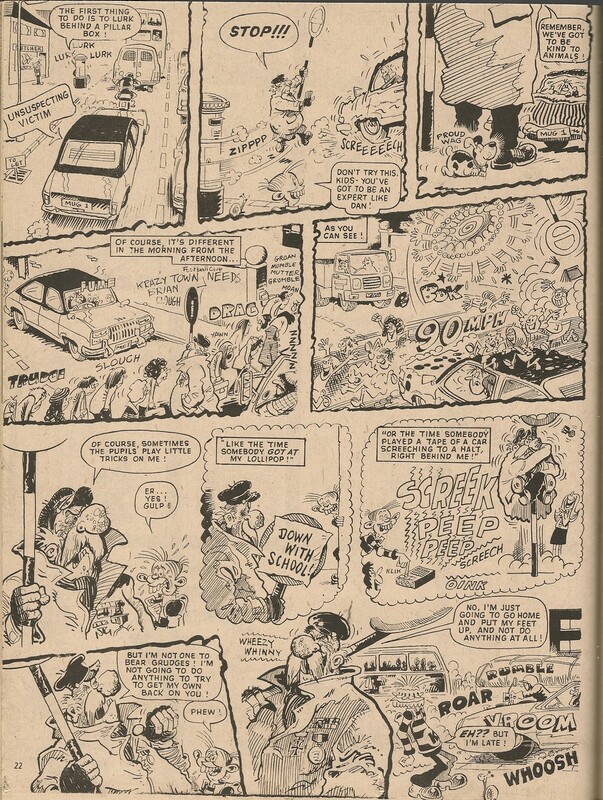 I've now got a copy of Comic Scene issue 2 - I opted for the digital version. 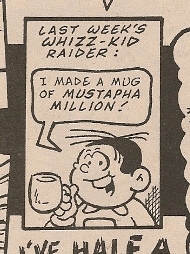 Publication was delayed a little (originally intended for 01 September), but the folks at the mag kept me, and no doubt others who had placed an order, informed of the situation which apparently resulted because the print run was increased, which is obviously good news. 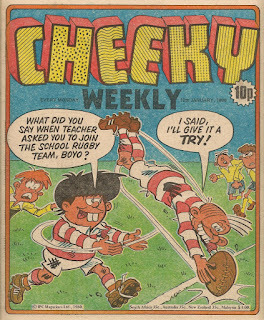 It was apparent from the pre-publication publicity shot of the mag's cover that it was to contain an article about Cheeky Weekly. 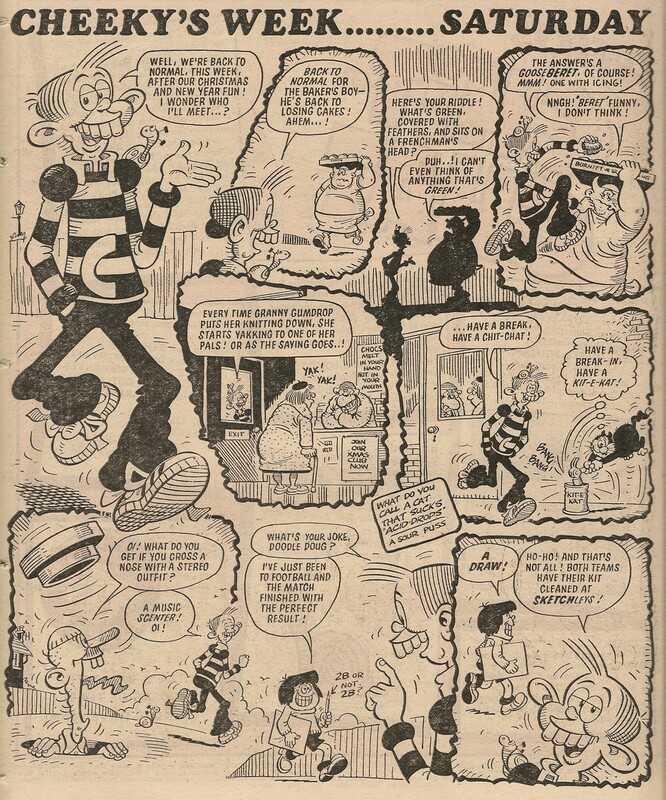 In my opinion there can never be enough mentions of the toothy funster's comic - it's rarely covered in nostalgic looks back at the comics of yesteryear, and I was keen to see what the piece contained. 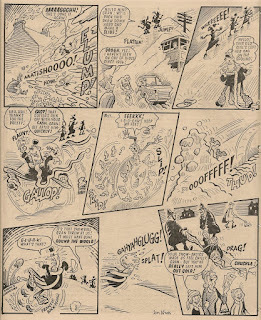 Written by Pete Doree of The Bronze Age of Blogs, the article contains his affectionate memories of the comic and a concise overview of Cheeky Weekly's unique properties. 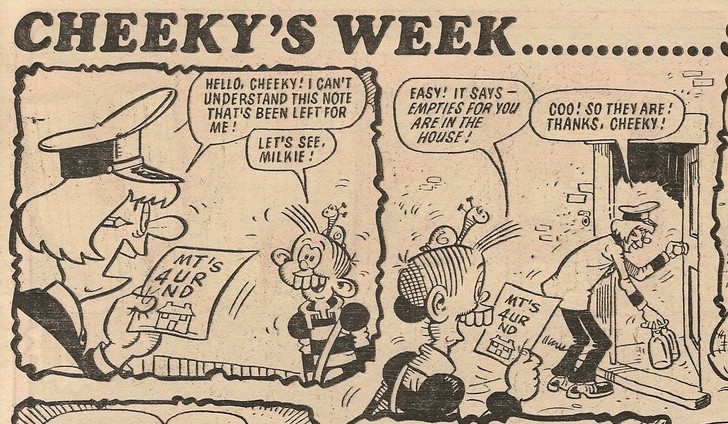 Pete does a good job of distilling the essence of our favourite title into the limited space available - 2 pages, one of which carries a Cheeky's Week page from the first issue. I'm hesitant to mention the couple of errors I spotted, but I'm going to anyway - Lily Pop is referred to as Lili, and Leo Baxendale is credited with providing art for the Creepy Sleepy Tales. 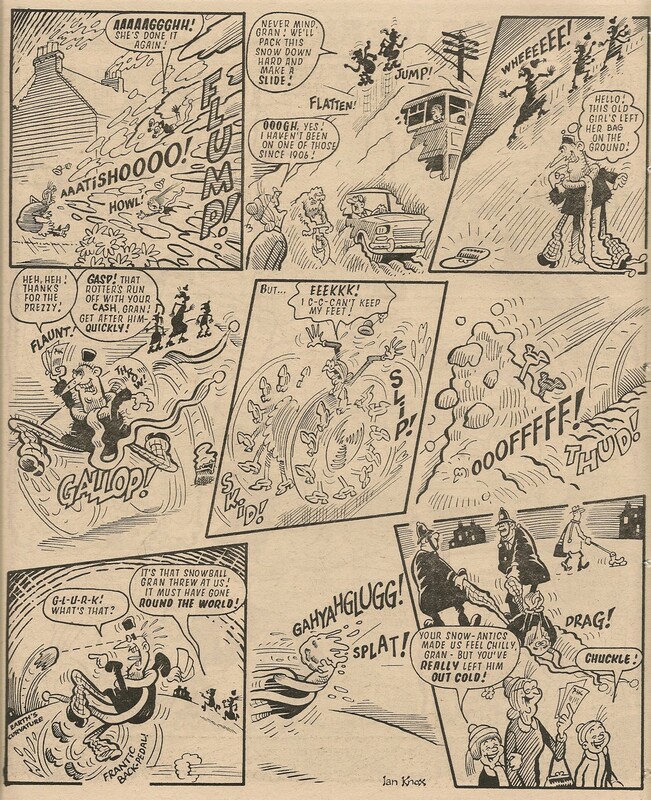 I haven't looked at any of the other articles yet but I'm sure this special humour issue will, at 64 pages, keep me amused for a while. 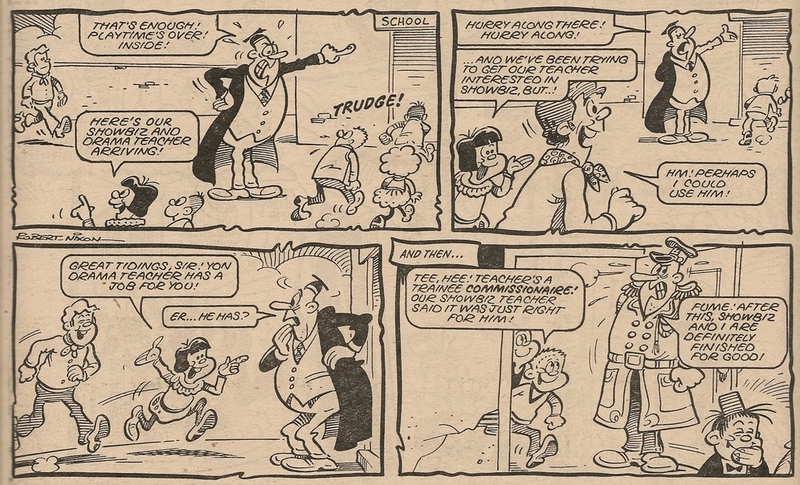 Imagine a nightmare version of Krazy Town where (now steel yourselves for this) luscious Lily Pop is not the school crossing attendant. 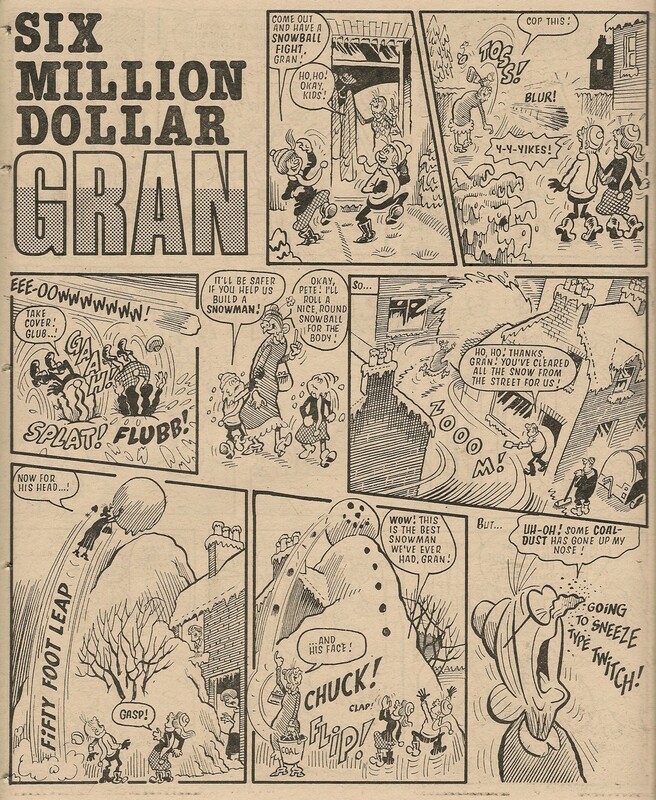 Unthinkable, yet there was a time when this was the case. 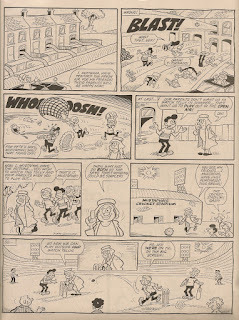 Krazy dated 26 March 1977 illustrated this horrific scenario, when Cheeky introduced one Daniel McSpaniel. 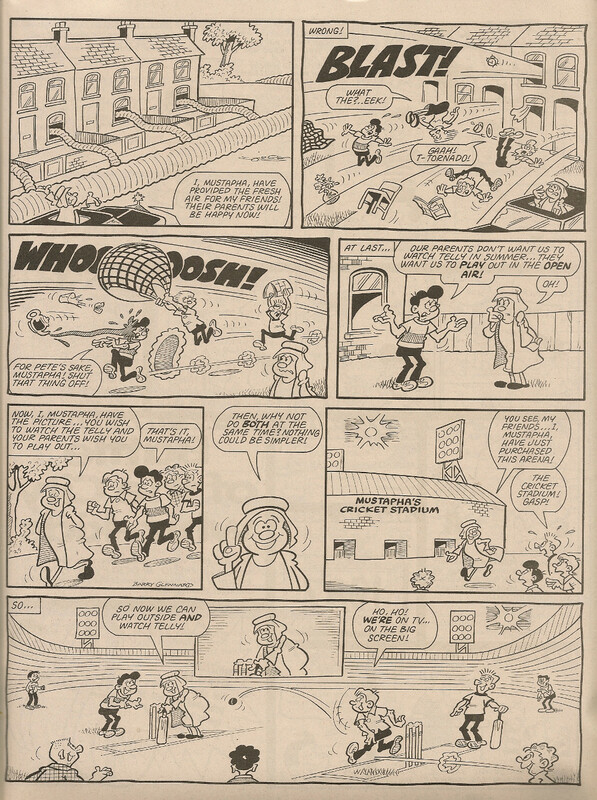 Dan Dan made no further Lollipop Man appearances in Krazy, as (fortunately for Lily Pop’s many fans, including the motorists of Krazy Town) it seems he embarked on a new career before returning in Krazy dated 04 June 1977 in a role which was to transfer into the spin-off and become a Cheeky Weekly regular, that of school gardener Dan-Dan the Lavender Man. Goalie Cat was of course the most frequent feline participant in the Cheeky’s Week pages, appearing in 71 issues, but there were two other memorable moggies among the supporting cast. 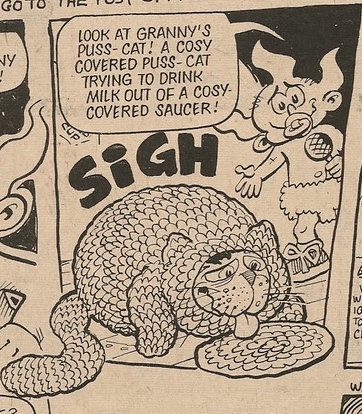 A number of anonymous felines featured on the Cheeky pages during the early months of Krazy, the first to appear being a rather scruffy, wind-swept individual sporting a plaster on his rump who made his unnamed debut in the 04 December 1976 issue. 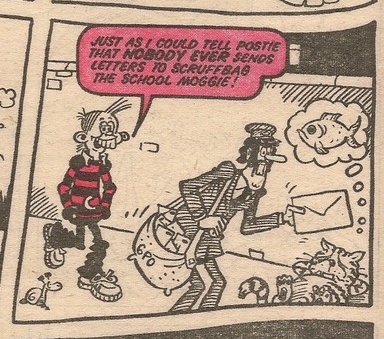 We were formally introduced to school cat Scruffbag in Krazy’s 02 April 1977 issue, some 7 months before Cheeky’s own title shouldered its way onto newsagents’ shelves. 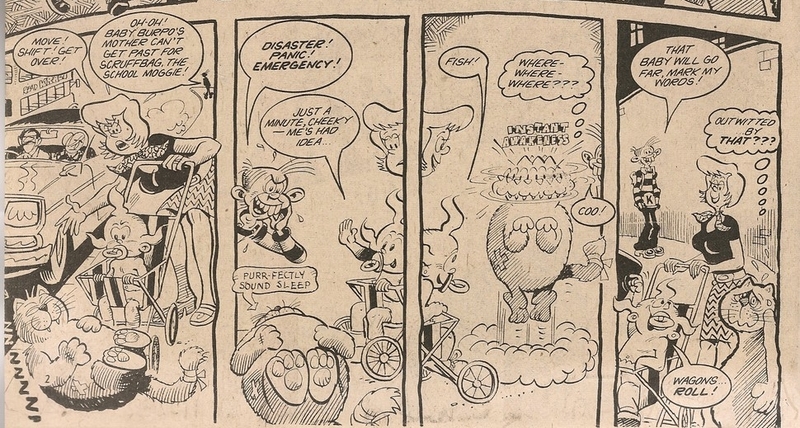 The lethargic animal evidently suffered some trauma to his rear end during the summer of 1977 as his trademark bandaged tail became evident in Krazy's 02 July 1977 edition. 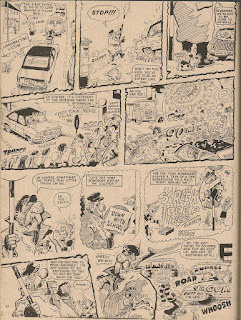 Krazy dated 27 August 1977 included a Cheeky’s Pal page devoted to the passive puss. 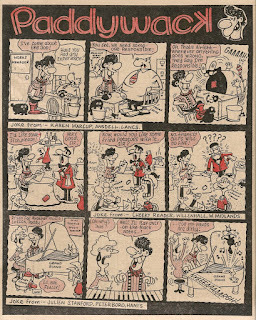 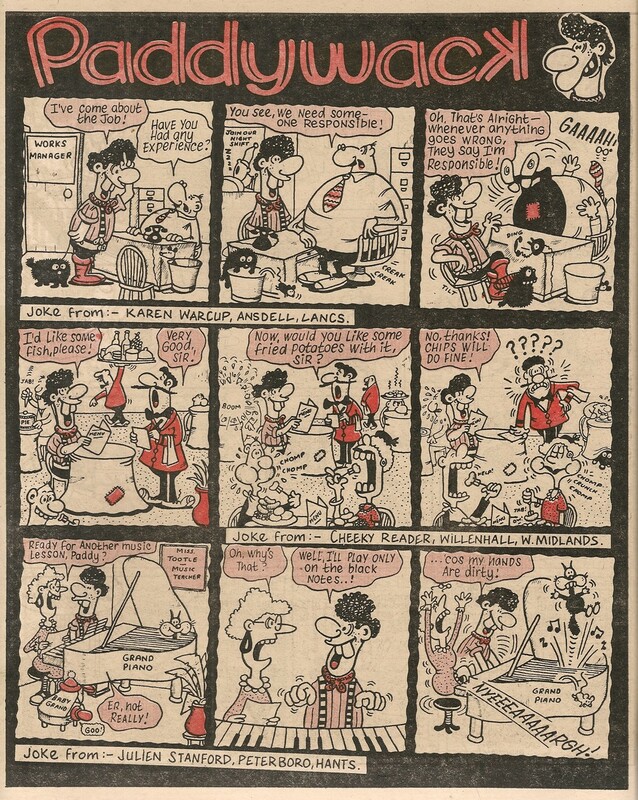 Scruffbag’s Cheeky Weekly debut came in the 05 November 1977 edition, wherein the indolent moggy appeared on the Sunday Evening, Monday and Tuesday pages. 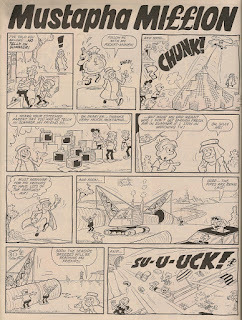 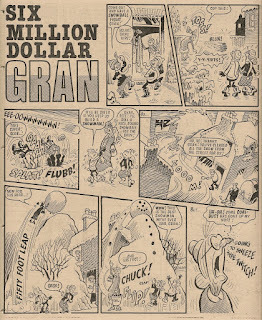 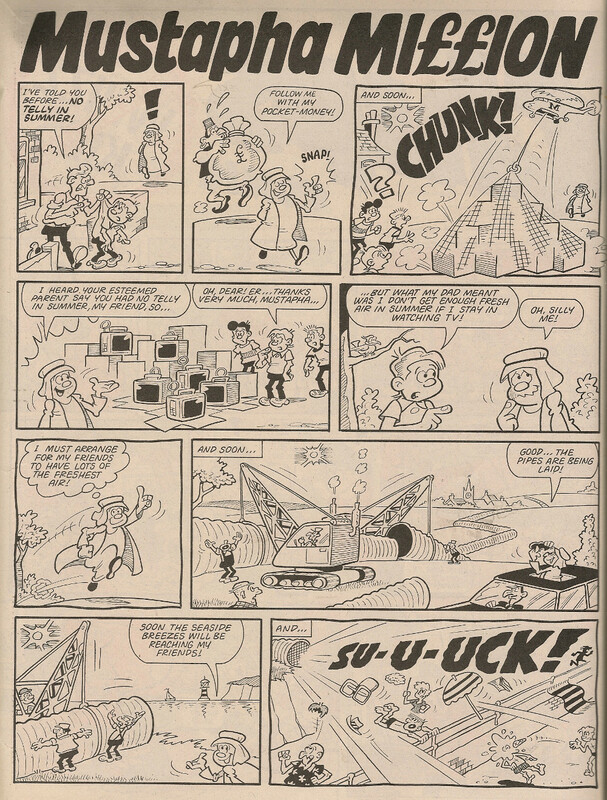 This was the highest number of appearances he made in a single issue of Cheeky Weekly, the next highest being his Monday and Friday outings in the 21 January 1978 comic. Nosy Nora suspects Scruffbag may have secreted the Mystery Comic about his purrson. 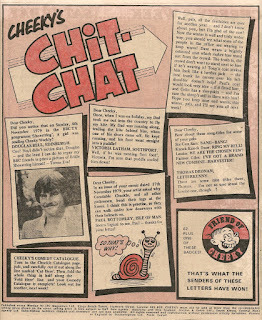 Cheeky’s feline friend appeared in the cinema during the interval in the comic dated 28 January 1978.
in the comic dated 18 March 1978. Fortunately the moggy was able to soon shake off the malady and by the time of his next appearance in the 22 April 1978 edition, had reverted to his normal scruffy self. 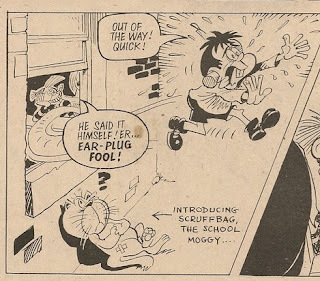 Scruffbag’s longest absence was the 32 weeks between his 09 December 1978 and 21 July 1979 farewell appearance. 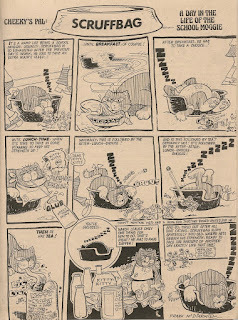 He contributed feline fun to 10 editions of the toothy funster’s comic. 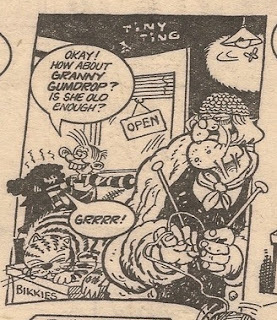 In the same 05 November 1977 issue of Cheeky Weekly that featured Scruffbag's debut in that title, Granny Gumdrop's cat Tired Tom also made his first appearance. 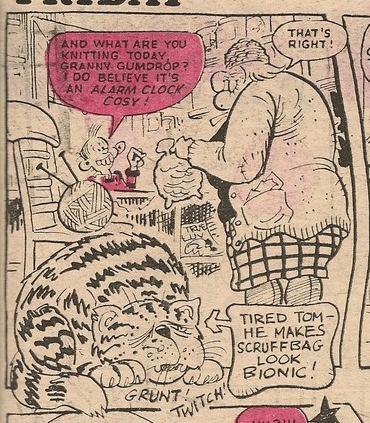 This stripy feline evidently out-snoozed his school-based comrade. 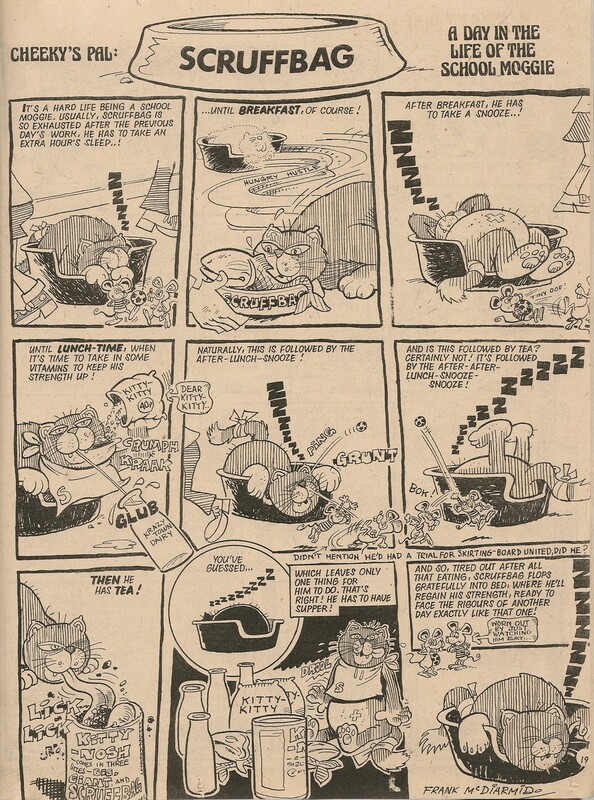 Possibly because the comic couldn't really accommodate more than one fatigued feline, Tom made only one more appearance in the toothy funster's title, that being in the 17 December 1977 issue. 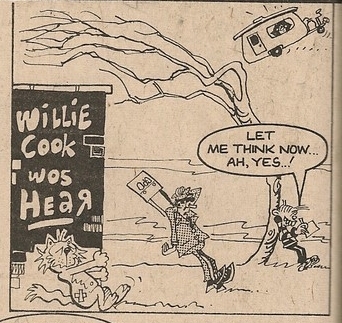 Thus he avoided, by a whisker, falling into the one-offs category. 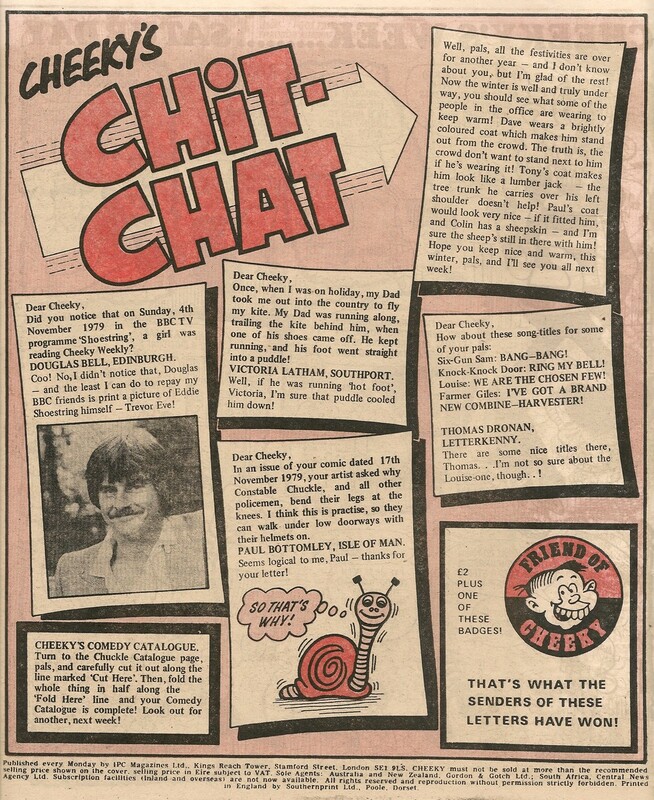 Although he did put in an appearance (of sorts) in Krazy dated 18 March 1978, when Baby Burpo was the subject of the Cheeky's Pal page.